Richmond struck for three runs with back-to-back home runs in the bottom of the first inning, and that was the only scoring as the Flying Squirrels took another low-scoring win. Jhon Nunez had a 3-for-3 night, and Josh Ockimey had two more hits, for five of the Sea Dogs' eight base knocks on the night. Teddy Stankiewicz surrendered just the three runs on seven hits. In six innings, he walked three and struck out two. Daniel McGrath finished the contest with two innings of one-hit ball. Salem got a run in the seventh on a bases-loaded walk from Bobby Dalbec, but that was all they would get in the first half of a twin bill. Enmanuel De Jesus had an uneven start, giving up four runs on seven hits in four innings of work. Hunter Smith allowed another pair to cross the plate in the remaining three innings. Santiago Espinal was the lone offensive bright spot, with a 3-for-4 evening. Salem salvaged the doubleheader with a split after going down 3-1 headed into the bottom of the third inning of the shortened game. Tyler Hill and Ryan Scott each had three hits with a double, while Scott added a triple to be a home run short of the cycle. Roldani Baldwin had three RBI despite a 1-for-4 showing thanks to a pair of RBI groundouts. Daniel Gonzalez gave up three runs on four hits in six innings of work and one walk with four strikeouts. Jake Cosart got his first save of the season with a scoreless seventh. Grenville pumped out only six hits but scored eight runs thanks to five extra-base knocks, including three home runs. Marino Campana and Victor Acosta each had two RBI. Hildemaro Requena struggled mightily, with seven runs on 12 hits going on his tab in just four innings. Hunter Haworth gave up two runs in the eighth, one of which was earned, after three shutout frames to send the game to extras as the Drive mounted a comeback. The Drive scored three runs in the sixth inning to turn a 4-3 deficit into a 6-4 advantage as they split the doubleheader. Marino Campana had another pair of RBI in the second half of the day, delivering two hits. Frankie Rios and Jordan Wren also had a pair of base knocks. Angel Padron gave up four runs, three of which were earned, on eight hits in five innings and Devon Fisher finished the game with two no-hit innings. He struck out four and walked one. The Red Sox had a five-run fifth and resisted the Astros' comeback effort in the seventh and eighth to hold on for the win. Lewis Baez carried the load offensively, hitting 3 for 4 with four RBI. He was a home run short of the cycle. Osvaldo De La Rosa grabbed his second save with a perfect ninth, and Brayan Aquino threw four shut-out, one-hit innings. He walked two and struck out six. In an error and walk-filled slugfest, the other DSL team was almost doubled up on. Eight of the nine starters for the Rays had multiple hits, while only three Red Sox did the same thing, as Danny Diaz' 3-for-6 day stood out. He hit a grand slam in the seventh to help him get to five RBI as well. Each of the five Red Sox pitchers gave up at least one run and four of them gave up more than five, but the staff combined to allow 10 unearned runs to cross the plate. 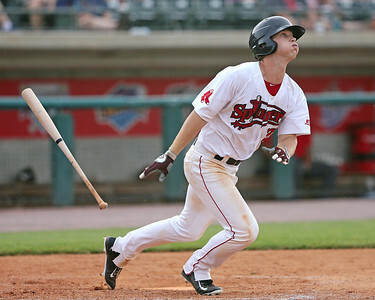 Player of the Night: Two players had three legs of the cycle, but it was Ryan Scott who did it in a seven-inning game. The 24-year-old has multiple hits in three of his last 10 games and has improved his strikeout to walk numbers, at seven to four in that stretch.